We have a range of high quality rope end fittings in a variety of finishes for use with our 24mm, 32mm and 36mm diameter ropes. 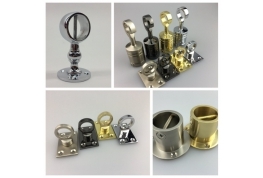 These rope fittings are best suited for use with our synthetic rope range such as Synthetic Hemp Rope, Synthetic Cotton Rope and Synthetic Manila Rope. 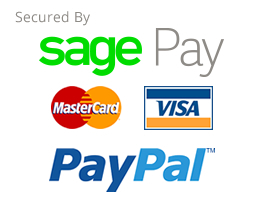 We are always on the end of the phone if you would like to discuss your requirement in more detail prior to placing your order. Rope End Hooks. Suitable for use with our 24mm, 28mm, 32mm and 36mm diameter ropes. Perfect as a way of finishing the ends of garden decking ropes and barrier ropes. Can be used with our matching eye plates or our barrier rope posts. Please select the size relating to the rope diameter you are using. Eye Plates. For use in conjunction with our matching range of rope hooks. Available in a range of finishes. Eye diameter is 18mm. Wall Centre Bracket, Available for use with either 24mm or 32mm diameter rope. Available in three finished, Brass, Chrome and Gun Metal. Rope End Caps.. 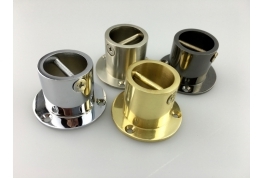 These rope end caps are an stylish and ideal way of creating a neat finish to the end of your rope. Ideally suited for use with our Synthetic Hemp rope. 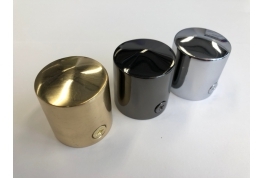 Available in three finishes, Black Nickel, Chrome or Brass.